Kingdom of Macedon - Alexander III, 336-323 BC. Gold stater, ca. 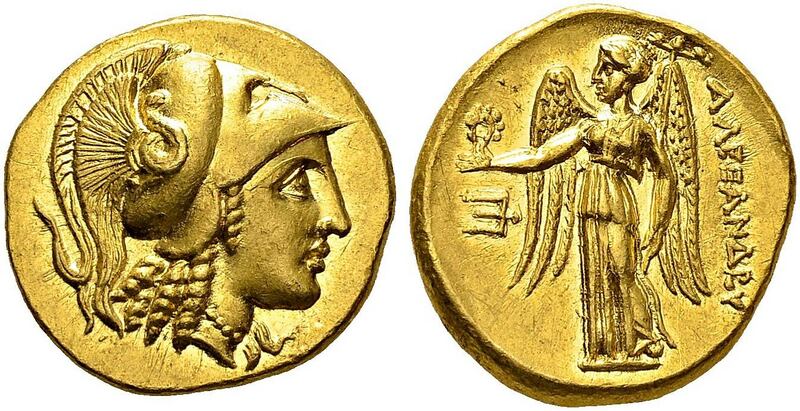 330-320 BC, Amphipolis. Obv. Head of Athena right wearing crested corinthian helmet pushed back on head, the bowl decorated with a coiled serpent. Rev. ΑΛΕΞΑΝΔPOY. Nike standing left, holding wreath in outstretched right hand and stylis over left shoulder, trident head in left field. M. Price, The Coinage in the Name of Alexander the Great and Philip Arrhideus, Londres, 1991, n° 175. Gold. 8.61 g.
Ex. Sotheby's Zurich auction, 26 october 1993, lot 35; Tkalec auction 1, february 2001, lot 62.